The United States Chess Federation - Robert Hungaski Wins Gold! Home Page Chess Life Online 2007 August Robert Hungaski Wins Gold! IM Robert Hungaski just won a gold medal for the United States at the Pan-American Junior Championship (August 18-24) in Riobamba, Ecuador. With this result he also earns his first GM norm and the right to play in the World Juniors in Yerevan, Armenia. Robert was born in Stamford, CT Dec. 8, 1987, but after his parents' divorce, he moved to Buenos Aires to live and go to school. This is why he hasn't been as visible in the U.S. 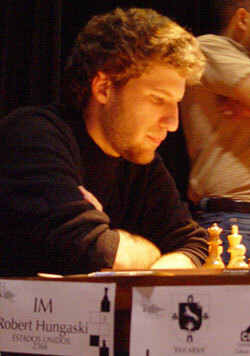 Chess scene as other top juniors- in addition to playing in American tournaments while visiting his father for several months a year, he plays frequently in Argentina, Mexico and Brazil. A bonus of this globetrotting lifestyle is that Robert is fluent in three languages: English, Spanish and Portuguese. Robert tells CLO about his victory in Ecuador: "I had a very strong positive attitude and I'm sure that helped a lot,as did the unconditional support of my friends and family, especially my mother." Robert currently spends almost half of his time with his father in Connecticut and is considering moving to New York to study International Relations. Robert was featured in a CLO story by Daniel Rensch about the [NEWS:7:234] U.S. Chess School, [/NEWS] Robert drew caricatures of the participants, including one of himself, which we reprint below. Robert enjoyed playing in Riobamba, a picturesque city where the tournament was held. "From any spot in town you could get a clear view of the neighboring volcanoes, which are among the largest active volcanoes in the world." Now Robert is currently focusing on the World Juniors and finding his second GM norm. Below, he offers CLO readers in-depth annotations to his crucial victory over the tournament's top seed, IM Damian Lemos (2456 FIDE). This was undoubtedly the most important, the most critical game of the tournament. After starting poorly, having drawn my first two games, in completely lost positions I managed to win three straight games and reach the tournament leader. My opponent, a strong, young IM from Argentina, had a full point lead over me with a perfect score of 5/5 so this meant I was in a "forced to win" situation. Luckily for me he is a very dynamic player which meant I would get my shot! I'm usually more of an 1 e4 player, but I knew my opponent would play the King's Indian and I could not resist the opportunity to surprise him! 1...Nf6 2.c4 g6 3.Nc3 Bg7 4.e4 d6 5.Nf3 0-0 6.Be2 e5 7.Be3 Ng4 8.Bg5 f6 9.Bh4 g5 10.Bg3 Nh6 11.d5 f5 12.exf5 g4! 14.Nf1!? Was quite popular for some time. The idea is to play Ne3 and pressure the g4-pawn. A novelty according to my database. Black's idea is to eliminate White's strong blockader on e4, simplifying the position. Precedents only show: 15...a5 16.a3 Qe7 17.Bd3 (17.Re1!? delaying the transfer of the bishop to d3 and thus keeping pressure on g4. 17...Nf6 18.Bh4! not allowing back his typical plan of playing ...Nh5-f4 which would give him some very dangerous counterplay. 18...Qe8 19.Bxf6 Bxf6 20.c5 1-0 Zhao Xue-Xiu Deshun/Jinan CHN 2005/The Week in Chess 546. 17...Kh8 18.Qe2 (18.Qc2 Bg6!? -- with the idea of playing ...Nf5-d4) 18...a4!? 19.Rad1! (19.Qc2 Nb6 20.Nd1 Bg6 21.Ne3 Nf5! Zivanic,M-Zimmerman,Y/Budapest 2000/EXT 2002 (37)) 19...Bg6 20.Rfe1 Bh5 21.Nb5! Rfc8 22.c5! If White were to play carelessly, let's say: 17.b4?! then he would lose control over the important e4-square. 17...Nf6 18.Nxf6+ (18.Qc2 Nh5! with initiative.) 18...Bxf6 19.Bxf5 Nxf5 and Black is a little better. Now if: 17...Nf6 18.Nxf6+ Bxf6 19.Ne4 and all is well. I did not want to rush into playing: 18.b4 Nf6 19.c5 (19.Nxf6 Bxd3+) 19...Nh5 is again quite unclear. 18...Nf6 19.Nxf6 Bxd3 20.Qxd3 Qxd3 21.Rxd3 Bxf6 22.f3! and Black will have some trouble getting his h6-knight into play. 20.Nxf6 Qxf6 21.Ne4 Bxe4 22.Bxe4 Nf5 23.Qd3! Not allowing Black to settle his knight on d4 just yet. Now I'm looking to double up on the h-file and put pressure on h5. This careless move allows White to enter a very comfortable endgame. 26...Bh6 allows 27.Rh1 Rf6 28.Rh2 a5 29.b5 Rg8 30.Rg1 with the idea of Ke2 and Rgh1. Black had to play: 26...a5! 27.b5 gxf3 (27...b6 28.Qe3 Qxe3+ 29.Kxe3 Bh6+ 30.Kf2 Kg7 31.Rh1 Rh8 and Black might just hold the endgame though he will suffer. ; 27...Bh6 28.Rh1 b6 29.Rh2 Rg8 30.Rdh1 gxf3 31.Rh3!! fxg2 32.Kxg2 followed by Rxh5) 28.gxf3 h4! 29.gxh4 Qf4 and Black stands quite well since White's pawn on h4 serves as great protection for the Black King. 29.Ke2 Rg8 and white has some problems with his g3-pawn. 29...Kg7 30.Rh1 Rh8 31.Ke2 Bg5? A sad necessity but Black had to play: 31...gxf3+ 32.gxf3 Bg5 followed by .. Rfh6 and h4, and White is much better but Black is holding for the time being. 34...b6 35.a5 bxa5 36.bxa5 Rf8 37.Rb1 and White will get his rook to b7 when Black's position collapses. 39...bxc5 40.Rb7 Rf7 41.Ra7+- where the a-pawn will decide. Black frees his king from the defensive task the h6-bishop posed him. Here I knew I could not allow him to reach d6 so extreme measures had to be taken! After calculating for quite a while I found this incredible move which simplifies the position to a won opposite colors bishops ending. This is the critical position I was analyzing on move 42. 49.Bc8 Kb5 50.a6 Kb6= and Black has enough counterplay. The c8-bishop stands poorly and Black's c-pawn will prove to be enough to hold the draw. This apparently drawish endgame is totally winning for White! The e-bishop easily controls Black's c and e pawns while all white must do is queen his g-pawn since Black's king is enslaved to the a-pawn. 52...Bg5 53.Kf2 e4 54.g4 Bf4?